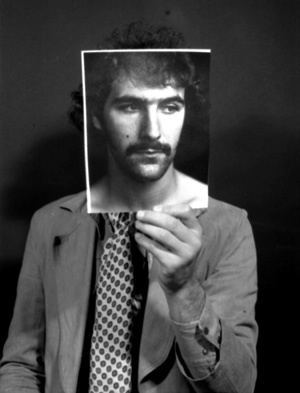 Self-portrait at Bournemouth & Poole College of Art 1976. The book is the final fruit of literary experiments I was doing in the 1970s and ’80s attempting to fuse autobiography and fiction in postmodern ways, very much under the influence of Jack Kerouac, William Burroughs, James Joyce and others. Those experiments were inconclusive and the various projects drifted, but much more recently, with the benefit of considerably lengthened perspectives, I came up with the idea of forming the material into a nostalgic memoir, approaching the reality/fiction-fusion element from the non-fiction side of the fence and making my literary experiments part of the story, hence the title. The other big factor in the tale is the drug experiments, involving LSD, cannabis, psilocybin and fly-agaric mushrooms — in both recreational and ‘psychonautic’ modes; that is with the aim of gaining higher spiritual or metaphysical knowledge. In this respect the influence of Eastern mysticism, particularly the Tao Te Ching, the I Ching and Zen Buddhism, figures strongly, as do the works of certain anthropologists who were popular in that period: R. Gordon Wasson, Weston La Barre, Richard Evans Schultes, Michael Harner and the now discredited Carlos Castaneda. Putting it in broad terms, these researchers explored the use of hallucinogenic drugs in tribal shamanism and came to striking conclusions about their influence on the formation of religions — such as in the case of Soma in the Rig Veda — and philosophy — as in the case of the Mystery of Eleusis, involving Plato and others. All this provided a heady brew for psychedelic drug users in what was a very colourful time in British life, when the mature hippy era was just being supplanted by the fashions and attitudes of punk, the Stonehenge Festival was huge, students were given state money for nothing and life was generally more carefree and easy… Until that fateful day in May ’79 when the dreaded Mrs T. took over and everything began to change for the worse — an event recorded in great detail in the book. So, with the passing of several decades, The Mad Artist has become a very period-conscious and nostalgic record of youthful exuberance — but not one that is viewed from the comfy armchair-and-carpet-slippers perspective of middle-age, but one of up-close immersement in the events, as though they were still relatively fresh, using a narrator who is a notional self aged twenty-four, positioned in time soon after the narrative’s conclusion, and is classically a narrator in the unreliable tradition. Therefore, though the work itself may be non-fiction, the method is assuredly ‘novelistic’.